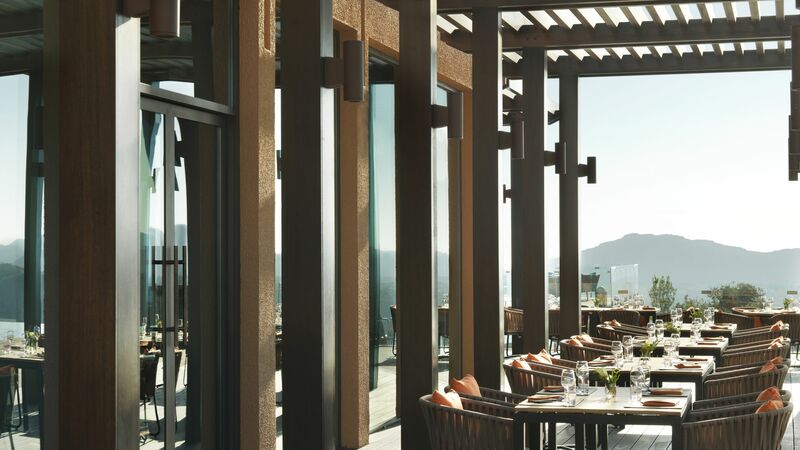 As one of the world’s highest located luxury resorts, the five star Anantara Al Jabal Al Akhdar is a jewel in the crown of Oman’s mountainous region. 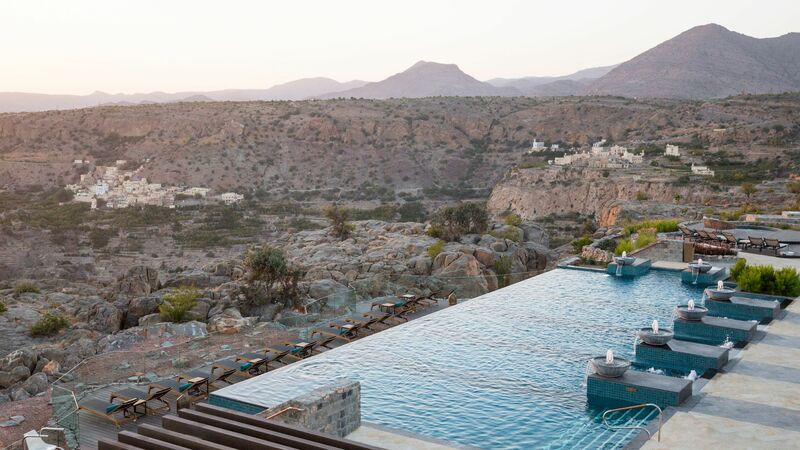 The resort is located on the edge of the rugged Saiq Plateau, part of the Jabal Akhdar (Green Mountains), an area synonymous with beautiful damask roses. Perched two thousand metres above sea level, the complex offers incredible views of the surrounding canyons and far reaching horizon. A sophisticated vibe runs through the core of this resort. 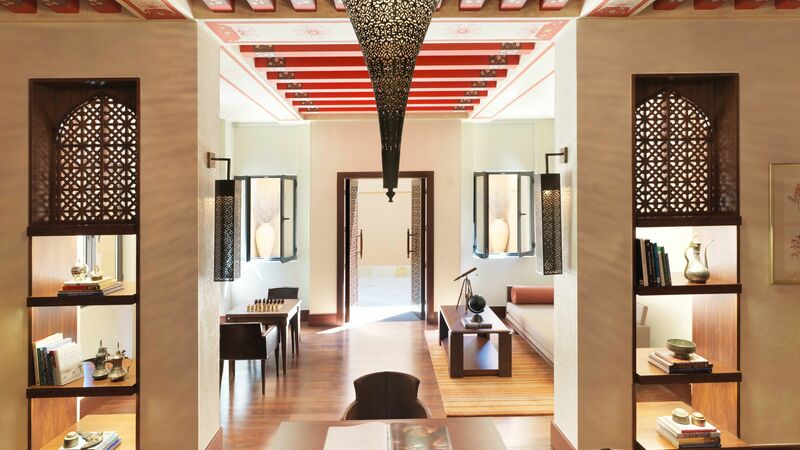 The elegant facade of the buildings reflect a modern twist on traditional Middle Eastern architecture, while a contemporary ambiance is created throughout the resort’s lavish Omani interiors. Rooms, suites and villas are sumptuously decorated and furnished, providing the perfect space to escape. The resort’s facilities are truly outstanding. The cliff top infinity pool provides breathtaking views and is named after Princes Diana, who was once a guest here. The resort’s spa exudes serenity and provides the ideal place to relax both the mind and body. Four restaurants are available, offering a delectable mix of fine dining, international cuisine, deli options and traditional menus. Plus, with a range of activities, from cookery lessons with an Omani chef to hiking in the mountains, there is plenty to keep guests entertained throughout their stay. A range of hotel child prices applies to ages 0–4 & 5–11 years. The hotel has 82 rooms and 33 villas. 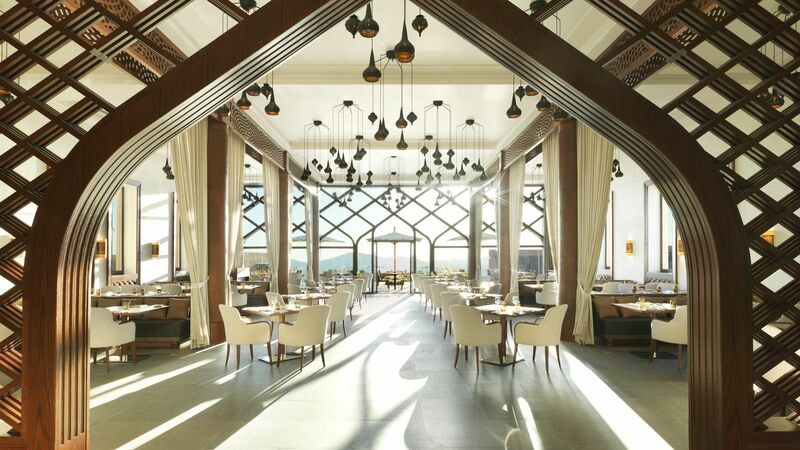 Offering food throughout the day, this elegant restaurant is set against a mountainous backdrop and serves an array of international dishes. Guests can also choose to dine outside on the terrace. Open: 07:00 - 10:30 every day and 18:30 - 20:30 on Thursday and Friday. Savour authentic Italian dishes at this poolside restaurant, which serves meals throughout the day. With stunning views of the surrounding canyon, this restaurant is the perfect place to watch the sunset. Open: 08:30 - 12:00, 12:00 - 19:00 and 19:00 - 23:00. 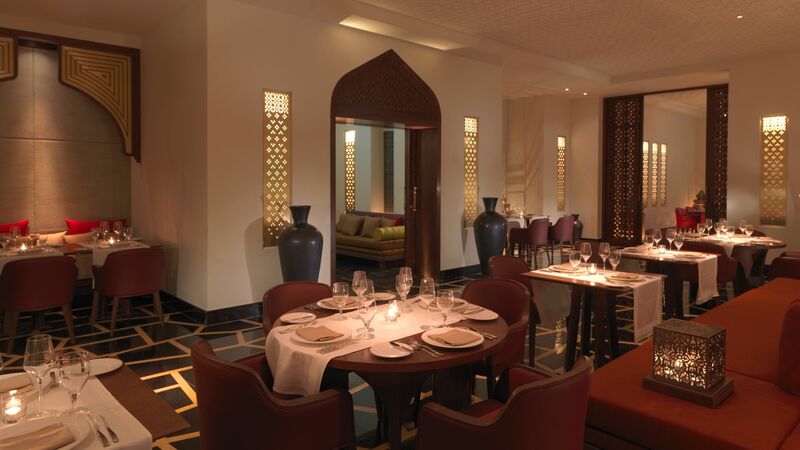 This chic restaurant provides an authentic Arabic dining experience like no other. The menu includes grilled seafood, and meat and vegetable specialties using fresh, high quality produce from the region. Open: 18:30 - 00:00 on Thursday and Friday. Set in a secluded courtyard, this deli and café is a popular spot for guests to socialise. 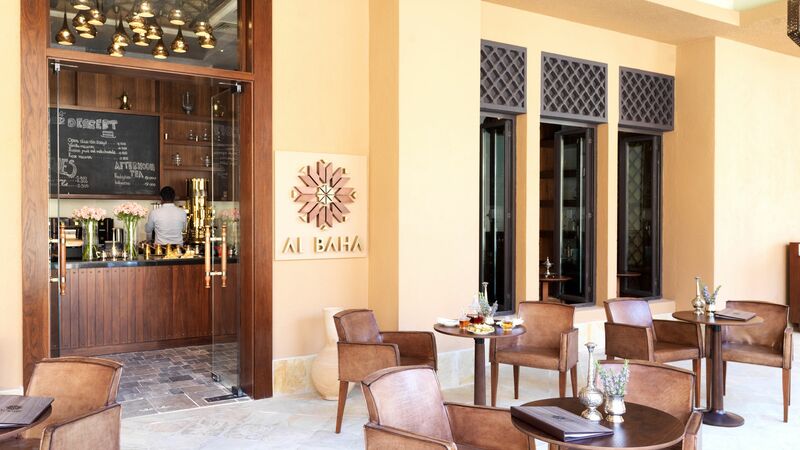 Al Baha serves a menu of light meals, coffees, teas, pastries and refreshments. 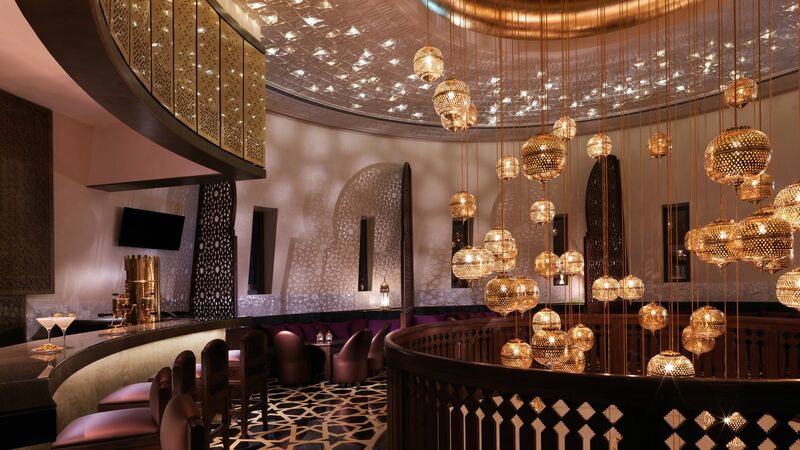 Savour speciality coffees, teas, exotic cocktails and other premium beverages as you embrace the soft, golden glow of the lanterns in this Moroccan themed lounge. A magical experience awaits as you watch the golden sunset from this rooftop shisha lounge – the ideal place to relax after dinner. Soak up the stunning views which envelop the resort from the temperature controlled infinity swimming pool. There’s a range of activities on offer to keep everyone entertained throughout the holiday, from children to teens, including arts and crafts and computer games. Oozing with Arabian exoticism, this is one of the world’s highest spas. 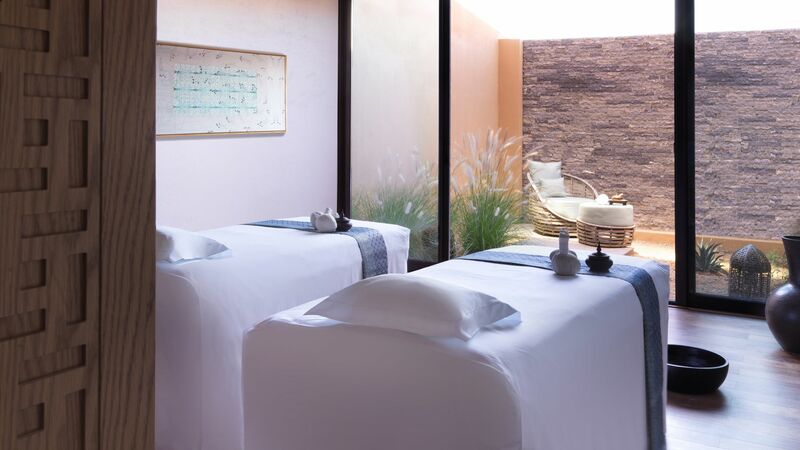 This serene haven features five sumptuous treatment rooms, his and hers thermal suites and outdoor relaxation areas. 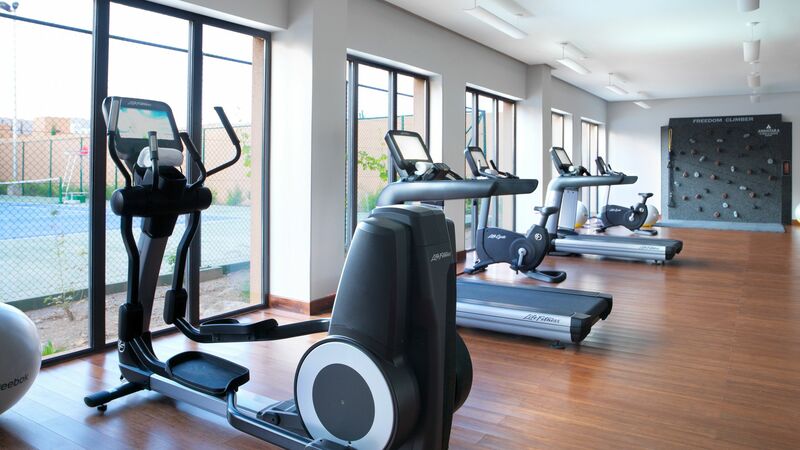 The state of the art fitness centre is equipped with a range of machines and free weights. It’s perfect for those who like to keep active on holiday. Immerse the senses in traditional, authentic cuisine. 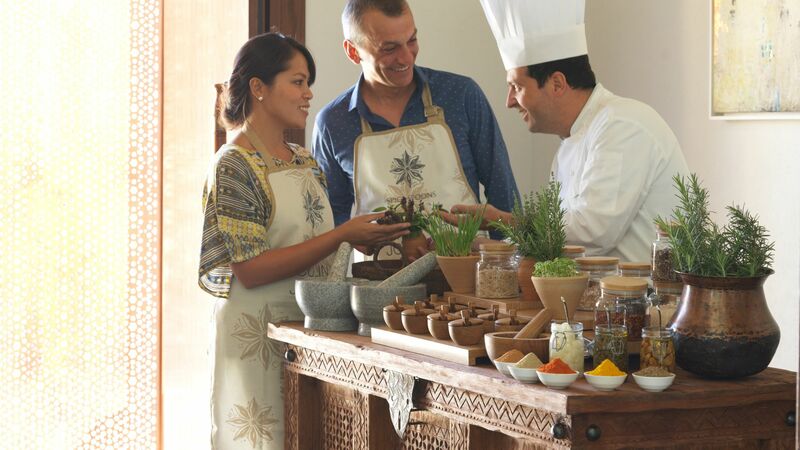 Join one of the resort’s cooking classes where you can get to grips with local ingredients and enjoy a tour of the chef’s garden. 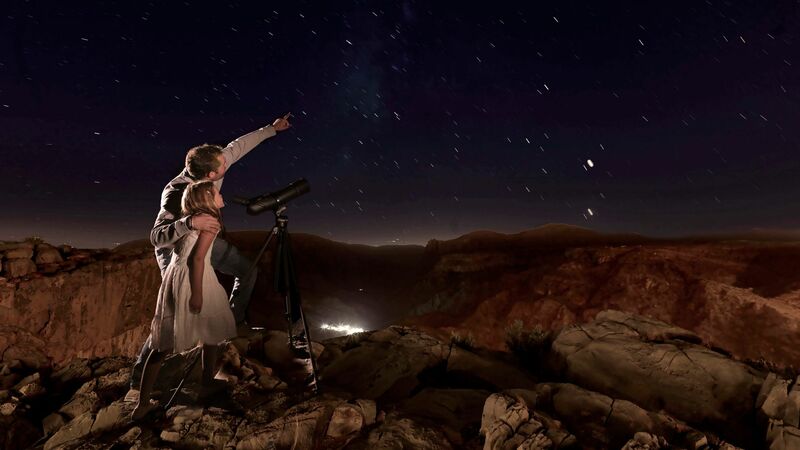 Stars dot the night sky like diamonds as you relax by the resort’s giant cinema screen. Surrounded by the majestic mountains, this is an experience not to be missed. Capture the awe-inspiring scenery of Jabal Akhdar and learn how to take stunning landscape imagery with the resort’s very own qualified photography guide. The resort’s extensive library offers a vast collection of books, Apple computers and business centre services. 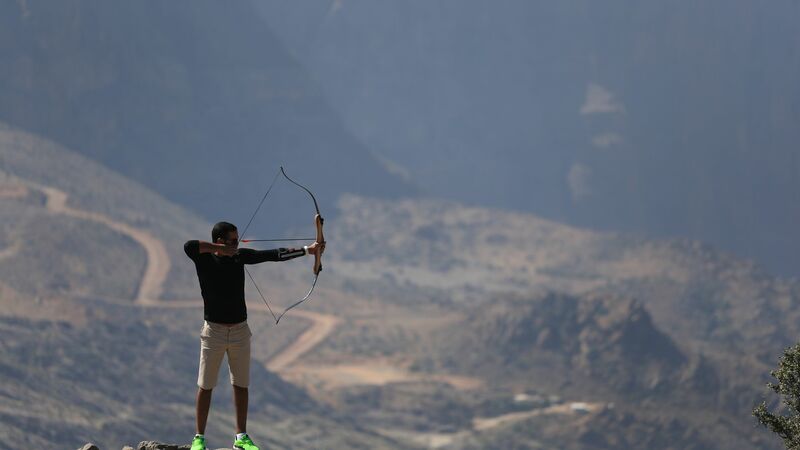 Take aim and fire into the horizon as you learn the ancient discipline of archery. Set against the backdrop of beautiful canyons, this experience is suitable for all abilities. Practice your serve and take in the views at the resort’s tennis court. With an incredible mountainous landscape which stretches out into the golden horizon the Jabal Akhdar (Green Mountains) region is as dramatic as it is beautiful. A combination of craggy peaks and deep canyons create an awe inspiring backdrop for the remote luxury resorts which can be found in the area. Tourists are attracted to Jabal Akhdar in order to completely escape to a unique Arabian world, often compared to a mirage. Boasting activities, including mountain hikes and rock climbing and outstanding luxury resorts, this area is ideal for adventure travellers, nature lovers and those who want to switch off from daily life. With its own micro climate, the weather in Jabal Akhdar is comparable to the Mediterranean. As a result, the area has rich flora and fauna, including pomegranate and walnut orchards, not to mention the Damask roses which are famed the world over. A feast for all the senses awaits for those who enjoy sampling different cuisine. From authentic local specialities including rosewater to apricot sweetened curries, Omani dishes are a gastronomic delight. 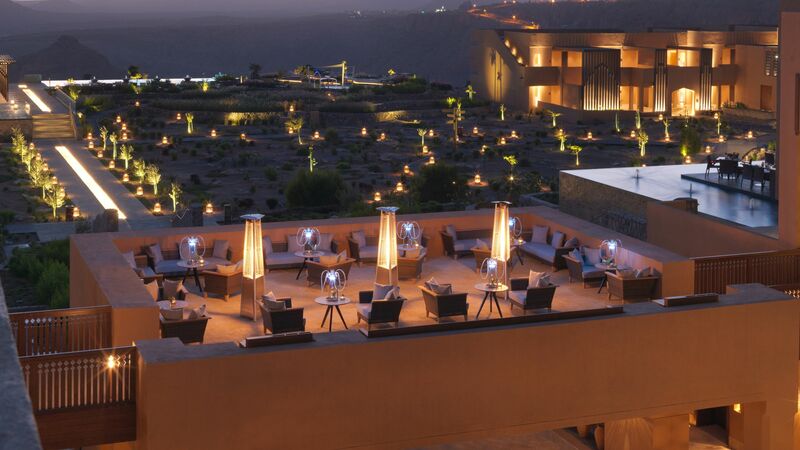 Anantara Al Jabal Al Akhdar Resort is 2 hours and 5 minutes drive from Muscat Airport. Premier Canyon View Rooms are located on the ground floor and feature a king size or twin beds, bathroom with rain shower and a separate bathtub, walk-in dressing room and a spacious balcony with breathtaking views over the canyon. Deluxe Canyon View Rooms are located on the first floor and feature a king size or twin beds, bathroom with rain shower and a separate bathtub, walk-in dressing room and a spacious balcony with breathtaking views over the canyon. One Bedroom Garden Pool Villas feature a bedroom with a king size bed, walk-in dressing room, bathroom with rain shower and a separate bathtub, living room, private garden and sundeck with sunbeds and a private temperature-controlled plunge pool. One Bedroom Cliff Pool Villas feature a bedroom with a king size bed, walk-in dressing room, bathroom with rain shower and a separate bathtub, living room, private garden and sundeck with sunbeds and a private temperature-controlled plunge pool offering amazing views over the rugged cliffs. Save up to 30% discount on the hotel price booked 90 days or more for holidays between 03 January - 08 April 2018 and 01 - 31 October 2018. Save up to 20% discount on the hotel price booked between 45 - 89 days prior to arrival for holidays between 03 January - 08 April 2018. Stay for a minimum of 3 nights between 03 January - 08 April 2018 and 01 - 31 October 2018 and receive free upgrade to half board. “ Amazing four nights - good for the soul! This hotel and resort is in an amazing location which is the perfect antidote to city life. I drove from Dubai (circa 6hours), it was a long but easy drive with the car in cruise control most of the way. During winter it was nice to go whilst the temperatures dropped right down in the evening, but the sky and air was clear. You will need a 4x4 to get access to the hotel if you are driving. (The road is fine but just steep). We had arranged a transfer from muscat airport direct and found this to be very efficient and relaxing way to arrive. Interesting journey and then you arrive at the hotel with the most stunning views. We had booked half board and particularly liked the a la carte restaurant. Breakfast was delicious and we sat outside enjoying the views. Our room was lovely and as requested close to the pool. The only thing I hadn?? ?t anticipated was quite a large number of small children at times. We went on a walk arranged by the hotel and found this very interesting. Stayed 4 nights as part of a 2 centre trip. We would return !